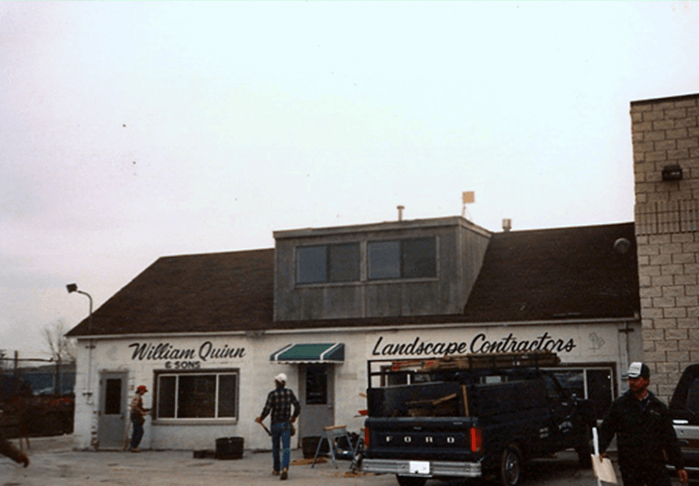 In 1951, with a pick-up truck, wheelbarrow, and lawnmower William Quinn started his landscaping company from the backyard of his Chicago residence. With each new season, Mr. Quinn consistently added new maintenance opportunities to his route until the business became unmanageable without hiring employees to keep up with the work. It wasn’t long before William Quinn had grown his one lawnmower operation into a fully fledged, family owned, corporate landscaping company. We grow our own nursery stock in Peotone, IL. We selectively hire our employees based on personality and experience which means that when our crews arrive on your property, you can expect to see a friendly, well groomed and uniformed employee. We use state of the art high quality equipment to ensure that our employees have the proper tools to make your property shine the way a “Quinn” property should. William Quinn and Sons now involves three generations of the Quinn family, and continues to operate under the strict code of complete customer satisfaction with which it was originally founded. We provide complete landscaping for commercial and residential customers and are a fully licensed Illinois contractor. Our mission at William Quinn and Sons, Inc. is to become the region’s premier landscaping company by providing residential and commercial property owners landscaping maintenance, design, building, and renovation with a proud focus on perfection and complete customer satisfaction.